causes a greater timber loss through decay of the heartwood of living trees than does any other fungus. It grows on nearly every species of conifer important as a lumber tree . . . and in only a few of its host species are its ravages equalled or excelled by any other fungus. You'd think that the fungal Terminator of the conifer world would be more impressive looking, but Porodaedalea pini (usually called Phellinus pini in field guides) is a nondescript, tough, medium-sized perennial with a yellowish pore surface composed of angular pores. Under the microscope, it features abundant setae. 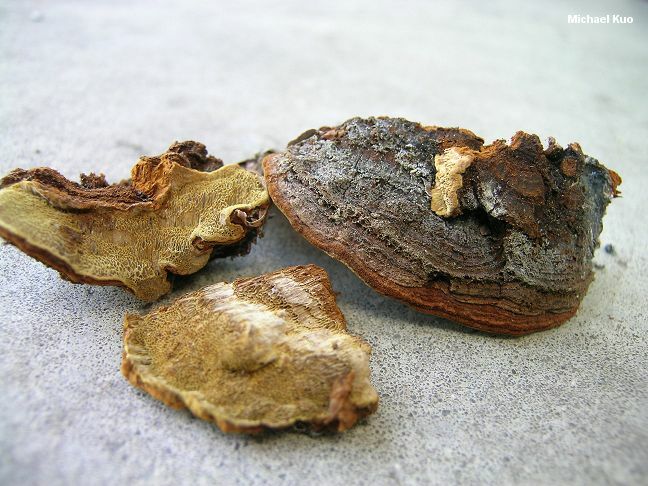 Phellinus pini is a synonym. Ecology: Parasitic on the heartwood of living conifers; also saprobic on the dead wood of conifers; very rarely reported on hardwoods; causing a white pocket rot; growing alone, gregariously, or in shelving clusters; very widely distributed in North America wherever conifers are present. Cap: Occasionally absent but usually present as a turned-over upper edge or, more commonly, as a well developed structure; up to about 25 cm across and 15 cm deep; vaguely kidney-shaped to semicircular or irregular; convex, becoming hoof-shaped; hairy toward the margin or overall; becoming furrowed and rough; usually zoned; reddish brown to gray-brown, dark brown, or black. Pore Surface: Brownish yellow to yellow-brown; with 1-4 angular to nearly slot-like pores per mm; tube layers up to 6 mm deep. Flesh: Reddish brown to yellow-brown; corky to woody. 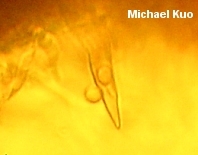 Microscopic Features: Spores 4.5-7 x 3.5-5 µ; smooth; broadly elliptical; inamyloid. Setae abundant; thick-walled; dark brown in KOH; 40-50 x 10-15 µ. Hyphal system dimitic. REFERENCES: (Brotero, 1804) Murrill, 1905. (Fries, 1821; Persoon, 1825; Saccardo, 1888; Overholts, 1953; Smith, Smith & Weber, 1981; Arora, 1986; Gilbertson & Ryvarden, 1987; Phillips, 1991/2005; Larsen & Melo, 1996; Miller & Miller, 2006; Trudell & Ammirati, 2009.) Herb. Kuo 09150710.